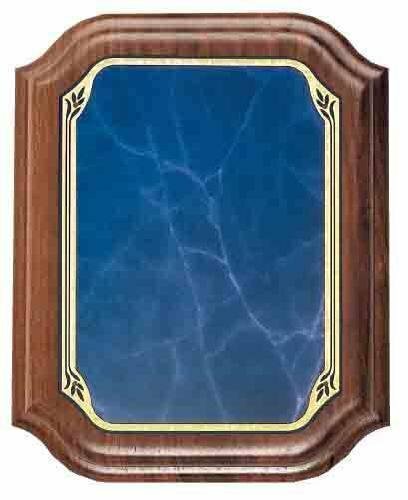 The Scallop Heritage Walnut Plaque has a Blue Marble Brass Plate. This award plaque is laser engraved. Your logo can usually be engraved on these wood plaques at no additional cost provided that vector artwork or a high quality black and white image is uploaded during checkout. 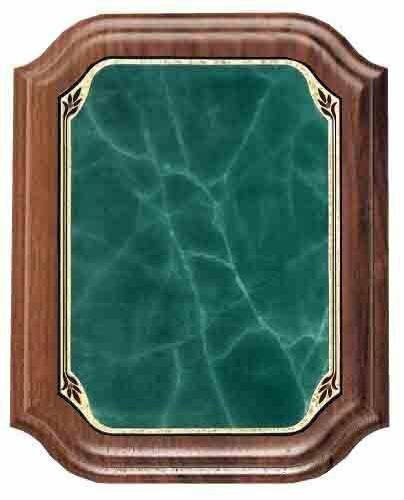 The Scallop Heritage Walnut Plaque has a Green Marble Brass Plate. This award plaque is laser engraved. Your logo can usually be engraved on these wood plaques at no additional cost provided that vector artwork or a high quality black and white image is uploaded during checkout. 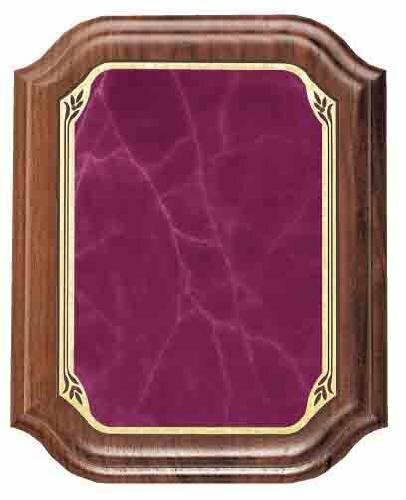 The Scallop Heritage Walnut Plaque has a Rose Marble Brass Plate. This award plaque is laser engraved. Your logo can usually be engraved on these wood plaques at no additional cost provided that vector artwork or a high quality black and white image is uploaded during checkout. 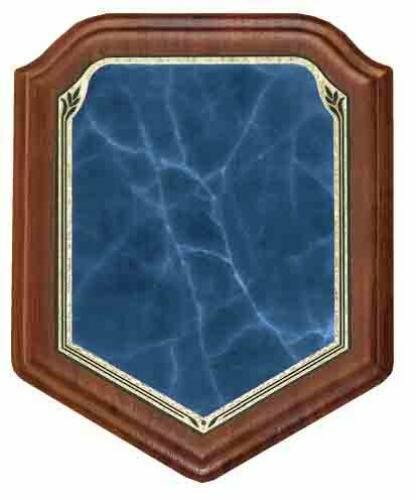 The Shield Blue Heritage Walnut Plaque has a Blue Marble Brass Plate. This award plaque is laser engraved. Your logo can usually be engraved on these wood plaques at no additional cost provided that vector artwork or a high quality black and white image is uploaded during checkout. The Shield Green Heritage Walnut Plaque has a Green Marble Brass Plate. This award plaque is laser engraved. Your logo can usually be engraved on these wood plaques at no additional cost provided that vector artwork or a high quality black and white image is uploaded during checkout. 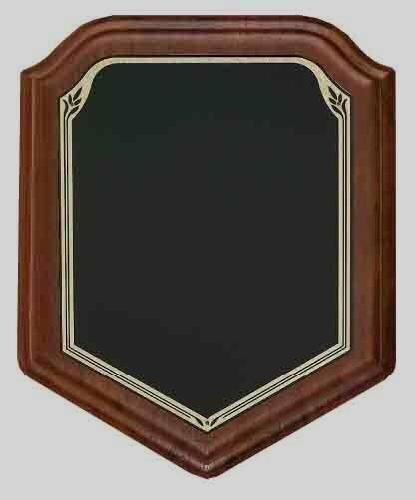 The Shield Heritage Walnut Plaque has a Black Marble Brass Plate. This award plaque is laser engraved. Your logo can usually be engraved on these wood plaques at no additional cost provided that vector artwork or a high quality black and white image is uploaded during checkout. 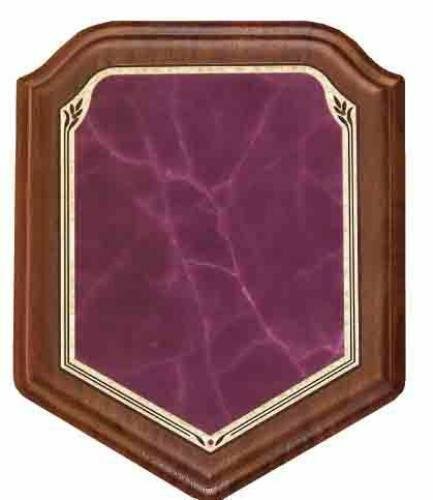 The Shield Rose Heritage Walnut Plaque has a Rose Marble Brass Plate. This award plaque is laser engraved. Your logo can usually be engraved on these wood plaques at no additional cost provided that vector artwork or a high quality black and white image is uploaded during checkout.